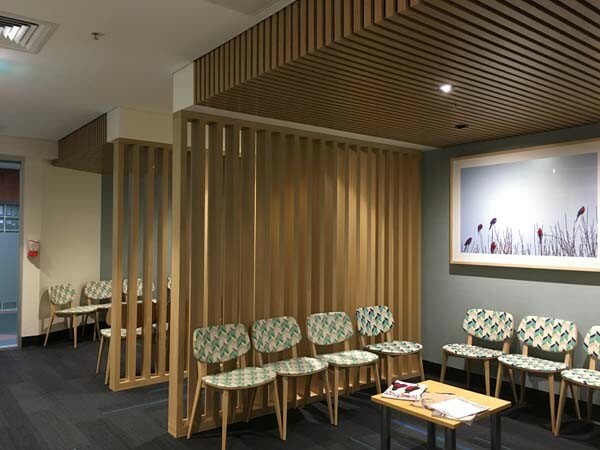 At the Fertility & Research Centre (FRC) in the Royal Women’s Hospital at Randwick NSW, timber ceilings and screens by SUPAWOOD create warmth in the reception and waiting area. Gran Associated Australia, the designers, were briefed by the client to create a non-clinical feel for these areas of Australia’s first holistic fertility clinic. Timber products, which were clean and easy to work with onsite, were a must as all work had to be undertaken in a live hospital environment. SUPAWOOD worked closely with both the designer and the builder Axis Group by providing samples, advice on available timber finishes, and then were able to supply a mix of matching slatted products to suit the design intent. The aim of this fitout was to provide a comforting and supportive environment for patients while waiting, so the space has been divided into smaller zones by using open screens made from Supaslat MAXI BEAM. These also form a walk-through from one area to another. Above the seated waiting areas and the reception desk, SUPASLAT profile 1 slatted ceiling panels have been used. The slats continue up the bulkheads at the front of these areas to further define the different zones. The MAXI BEAM screens are in Light Tas Oak SUPALAMI laminate, which matches perfectly the Tasmanian Oak SUPAFINISH concept veneer of the SUPASLAT on the ceilings and bulkheads. These lining products are prefinished and all components were fabricated offsite to make installation quick, mess-free, and completed with minimal disruption to the operations of the clinic. This meant a tight deadline and budget were successfully met.